This project is perfect for kids of all ages and a great way to use up scraps of yarn and tissue paper. I used a combination of Mod Podge Gloss and Mod Podge Hologram Glitter to get the ultra shiny and glittery look. For teachers or anyone wanting to make this in bulk, check out places like create for less for larger quantities of cones. If you have a local floral supply shop - try them too. I have also seen a few goodies at the dollar store that could be altered to do this technique. Use the instructions as a spring board for your imagination. 1. Cut the tissue paper into small random shaped squares. Apply the squares to the Styrofoam tree with Mod Podge. Topcoat with a layer of Mod Podge. Add additional layers of tissue. Allow for dry time between layers. 2. Cut the yarn into 3 to 5 feet long pieces. (Use more yarn for a fuller wrap and less yarn for an open look.) Pool some Mod Podge Glitter onto a piece of wax paper. Saturate the yarn in the Mod Podge Glitter. 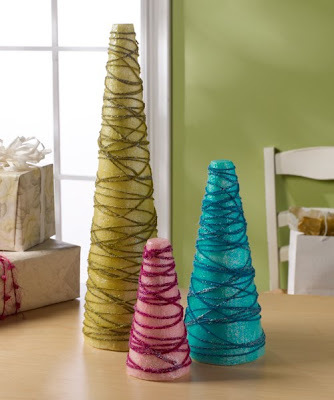 Wrap the wet yarn around the cones. Allow to dry. There's a Christmas Advent Calendar that has great interactive games and activities for kids and the whole family. All games are printable and easy to be laminated and reused each season! Love this idea! I have been looking for some great crafts to do with my girls and this is perfect! Thank you! I stumble across this site only accidently. I am from Australia and watch 'creative juice' every weekday here! I'm looking forward to seeing all you super ideas!